Outlook for 29th April - 1st May...on Current Weather Page. Hot Weather Warning for Nagpur and Pune !...Mumbai Page..
Its narrow isobars made an air "parcel" rise up, and the Lifted Index in the region showed a negative 6 figure. The reason I call it as an upset is because the resultant thundershowers were widespread in NW Sub-Continent, Gujarat, North Maharashtra and, simultaneously, our friend,WD (A-5) moves in and interacts with this trough. Again, snow and rains in the Northern hills. As a result, and expectedly, the day temperatures fell, and the seasonal low was almost wiped out. To add to the commotion, an "unfriendly" Low, and associated UAC formed over Oman, bringing good rains and cooler weather from Oman to coastal Balochistan. The very regions where the seasonal Low is supposed to spread its wings into later. The sesonal low in the Thar region is now very weak and hardly can be acknowledged as a "growing" Monsoon Low. Days temperatures have "performed miserably" in the MW-2/MW-3 inter period ! Below normal temperatures by as much as 18c have been recorded, and the highest on 25th April was 39c in the Sindh areas, and 41c in India. yes, there was an occasional isolated 44.5c, but, we have yet to see a 45c ! An exception this year is the Vidharbha region. Even without the normally exceptionally heavy rains, the temperatures are just about managing 42/43c (till 25th April), and in some cities just hovering around the low 40s. Normally Vidarbha is a hotbed ! 45-47c is a "kid's playground" for the region. In 2011, the minimum temperatures in the region were higher comparatively at this time. Minimum temperature touched 30c for the first time in 2011on 29th April at Kota (Rajasthan). In 2010, 30c as minimum was recorded on 17th April. And contrast this with the night temperatures today. The max and min temperatures have to rise now. Trends of rising temperatures may be seen again in Vidharbh, Gujarat and adjoining regions of Sindh across the border. True, the entire sub-continent region has to suffer a heat wave, but the gains are much more. The line of dis-continuity, currently "mis -behaving" due to WDs and upper troughs, should shift back to its normal position, in the centre of the Southern Peninsula region. Out breaks of pre- monsoon thundershowers are expected normally in the southern states and South Maharashtra. Though the showers in the South are heavy. We need the thundershowers to commence and precipitate in Maharashtra and Interior Karnataka, indicating a proper flow of moisture into the peninsula region. A LWD in the central peninsula region "looks after" the moisture content in the interior areas, and prepares the atmosphere with the humidity required fro a proper and good rainfall in the Lee ward regions. Continuing from MW-2, "Bay of Bengal" low pressure parameter is a worrying factor. Normally, the Bay should host a pre-Monsoon low anytime after 15th.April. Like I mentioned in the previous MW, in 2011 we had a cyclone in the Bay by the third week, and in 2009 a cyclone crossed the Bay on 12th April.2012 hosted a low around 25th April (BB-1). As on today, this region still maintains a luke warm response to the formation of a quick low. The pressure is anything but low, and the winds indicate a weak "high" trying to stabilise itself. What is needed now is a pulse from the Far East, to start with, and break up the existing high pressure area. But for this, we may have missed the first bus, as the MJO has entered a weak phase in the Bay region. Fortunately, the MJO turns "Neutral" to slightly positive in the Maldives and Maldives region after 1st May. This will bring heavy rains in that region, giving a "false alarm" of the SW Monsoon, as, with the MJO, the rain patch will move East wards, and this will send favourable indications for the Bay. Only +ve sign of a quick formation is that the SST is conducive. Map shows around 32c near the Andaman Islands. Good temperature for quick low formation. The Southern high pressure region, the Power House of our Summer Monsoon, is constant down in the Southern Hemisphere, off the Madagascar Island, and in the mid South Indian ocean. However, The region below the equator in the Bay sector is almost in the same situation as MW-2, with SE winds tending to bend SW South of the Bay in the 95E-100E region.These winds are weakened by a Low at 10S and 87E, which has sucked off a portion of the SE winds towards the low itself. Low will move away Southwards, thereby delaying and off setting the ICTZ again. Remember, the normal date for SWM to hit the South Andaman Sea is 15th. May. 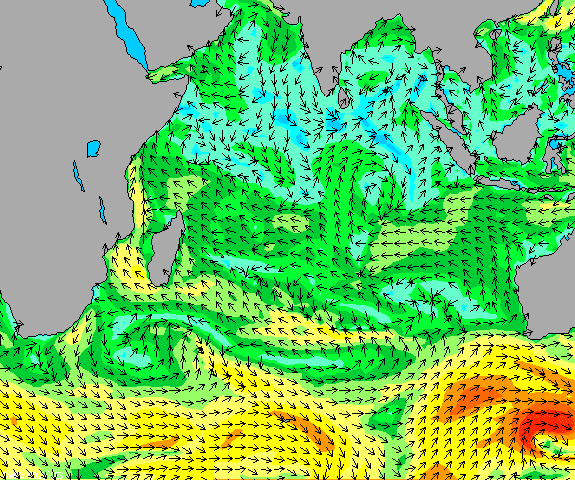 Amidst this, no cyclones are likely to form off Australia this season. If no further low pressure forms there till end of April, the ITCZ can start moving North. Currently it is at 7S. It needs to cross the Equator by 10 th May. As the ITCZ tracks north, associated MJO waves can "ride" along with. Meaning, after the shift, more MJO waves in the Northern Hemisphere (read Bay regions). ENSO the same as reported in MW 2. Not much significant warming is seen in the region. The 30-day Southern Oscillation Index (SOI) is +6.5.. It should remain Neutral for the next 2/3 months. If, by any chance, the ENSO swerves from normalcy, it would mean more/less than normal rains in June. Normally I would put up the estimated Dates of Monsoon arrival in this MW, but, seeing the changing scenario, would like to wait for a few days. Will put up an additional (brief) MW -4 on 30th April, with the Dates of expected arrival of Monsoon. wondering if the monsoon prediction and published in all the newspapers by our IMD is it based on some facts or purely a hype created to put the farmers and industry in relax mode.. Cause they have been going overboard predicting arrival of monsoon on time and also 98% normal monsoon.. Does Vagaries choose to disagree with them?? Looks like heat is likely to build up in north quickly with steady rise in day n night temperatures, along with clear skies. Chennai max temp for today : NGBKM 37.1c, MNBKM 38.6c. Kodaikanal max temp 20.5c today. Rajkot max temp 40.7c & Surat max temp 41c for today. Pune AP(Lohagaon) max temp 41.4c today. Vagaries max temp 32.5c today. Chennai max temp for today : NGBKM 35.7c, MNBKM 37.3c. Kodaikanal max temp 21.1c today.